Fire extinguisher bottles are containers that held chemicals. 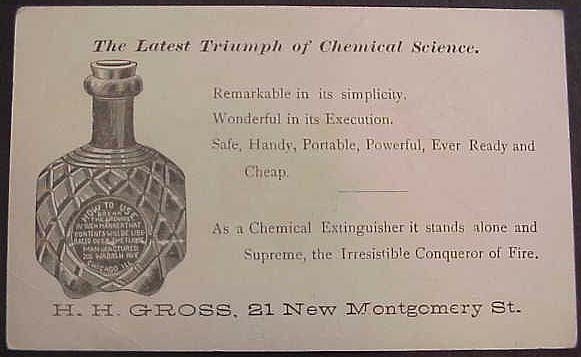 The bottle was thrown at the base of the fire so the bottle would smash and release the chemicals - putting out the fire. Most were made after 1870 and until about 1910. These bottles are rare since they were made to be destroyed. They are often ornate and come in striking colors, so they are very sought after by collectors. Photo of 3 position rack for the Haywards pleated or diamond panel pint grenades. 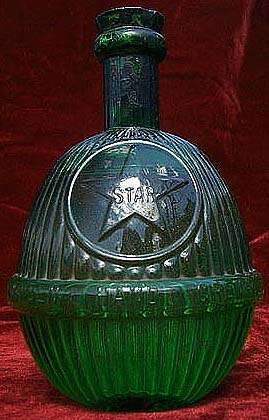 Check out this Harden Star fire grenade in a rare green color. Owned by Al & Ginny Way, Email: cd162@usa.net. 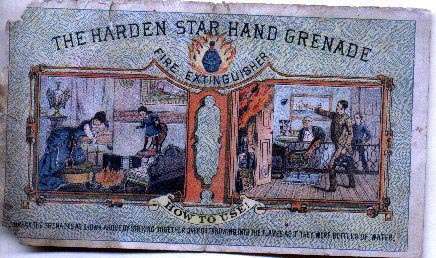 Here is the photo of a rare trade card advertising Harden's Fire Grenades and showing how to use them: woman banging them together over a fire in her parlor - 2nd scene shows man throwing one at a fire in his office. Glenn Poch's newsletter article on Fire Grenades. 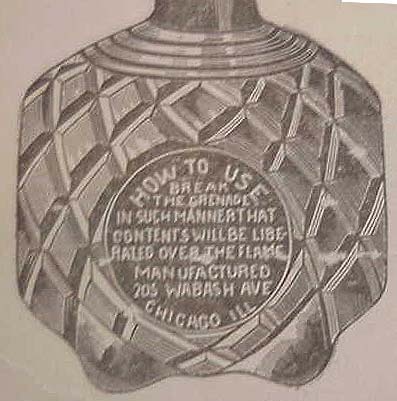 Many Fire Grenades are bought and sold online at ebay. Check for them by searching all ebay categories for Fire Grenade.